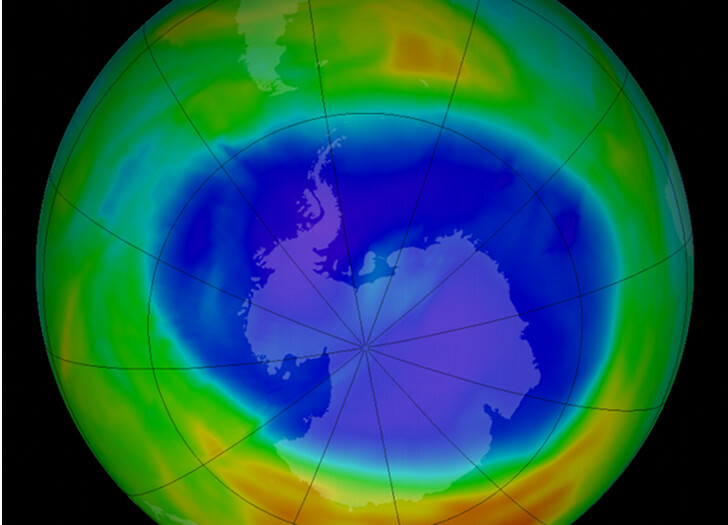 Data from NASA shows that this year’s hole in the ozone layer above Antarctica remains largely unchanged. On September 9, 2014, it measured 24.1m square km, which is roughly the size of North America; only a little smaller than the largest hole ever observed, which occurred in the same spot in 2000, and much the same as it was at its peak in 2010, 2012 and 2013. We used to hear a lot about the ozone, and why it is so important that the thin layer of gas remains intact; the ozone layer protects us from UV rays, which cause elevated rates of skin cancer and substantial harm to plant life and phytoplankton. Chlorine-containing emissions cause a depletion in that protective layer of gas. But in 1987, the Montreal Protocol was signed, which bans the use of Chlorofluorocarbons (CFCs) that occurred in a wide variety of household items such as aerosols, insulation and refrigeration systems. 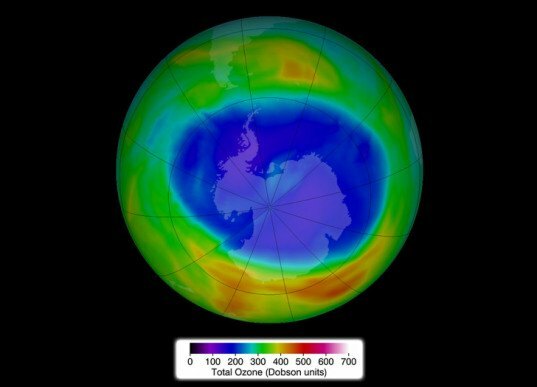 With the signing of this protocol, scientists predicted that the holes in the ozone would repair themselves. So if the Montreal Protocol was signed some 27 years ago, why is there still a continent-sized hole in the ozone? In short, it’s a work in progress. Speaking to the Guardian, Dr Jonathan Shanklin, emeritus professor at the British Antarctic Survey in Cambridge and one of the three scientists who discovered the hole in the 1980s, explained: “It’s broadly on track [to reduce in size]… We knew it was always going to take a long time to recover because the CFCs were long-lived.” The United Nations Environment Program (UNEP) suggested recently that it might be another 35 years before we recover the 1980 levels of ozone. And as the hole in the ozone fills in—potentially driven by warmer weather—we may see an increase in climate change. “As the ozone hole [gradually] fills in, so we can expect, over the next 50 or so years, the effects of climate change to increase. We will see different patterns of climate change,” explains Dr Jonathan Shanklin. Data from NASA shows that this year's hole in the ozone layer above Antarctica remains largely unchanged. On September 9, 2014, it measured 24.1m square km, which is roughly the size of North America; only a little smaller than the largest hole ever observed, which occurred in the same spot in 2000, and much the same as it was at its peak in 2010, 2012 and 2013.